The Canadian Oncology Nursing Journal is now published online, open access, at www.canadianoncologynursingjournal.com. The journal is available for download in its entirety, or full-text peer-reviewed articles and feature columns can be viewed individually. The Canadian Oncology Nursing Journal is published quarterly in the winter, spring, summer and fall. It is the only Canadian publication in cancer nursing. It is a bilingual, peer-reviewed journal dedicated to the interests of the professional nurse who provides care to patients with cancer and their families. The journal endeavours to publish timely papers, promote the image of the nurse involved in cancer care, stimulate nursing issues in oncology nursing and encourage nurses to publish in national media. Content includes peer-reviewed original manuscripts relating to clinical oncology practice, technology, education and research. A variety of regular columns focus on research issues, materials on review, profiles of individuals or programs and clinical tips, as well as CANO position statements. Readership includes nurses practising in all areas of cancer care, including clinical practice, education and administration, and involved with a variety of cancer populations, including breast, GI, lung, Hem/Onc, GU, Gyn, head & neck, CNS and others. Approximately 1,200 subscribers receive email notification when each issue is published online, including members of the Canadian Association of Nurses in Oncology (CANO). Readership includes a growing international audience, ensuring that advertisements on the CONJ website provide a direct link to both the national and broader international oncology nursing community. Online advertising on the Canadian Oncology Nursing Journal (CONJ) website provides instant access to the full journal readership, including members of the Canadian Association of Nurses in Oncology (CANO), subscribers and an expanding international audience. In a three-month period from January to September 2018, showed more than 20,800 unique users and close to 5,000 unique visitors. Full page: 8.5" × 11"; type margin: 6.75" × 9.5"
1/2 page: 6.75" × 4.75"
1/2 page (vertical): 3.25" × 9.5"
Publisher prefers ad files in .gif, .jpeg or .png formats. Advertiser should provide desired landing URL and or logo file, as required, with submission of ad file. Ads will be posted for three months on http://www.canadianoncologynursingjournal.com unless otherwise requested. 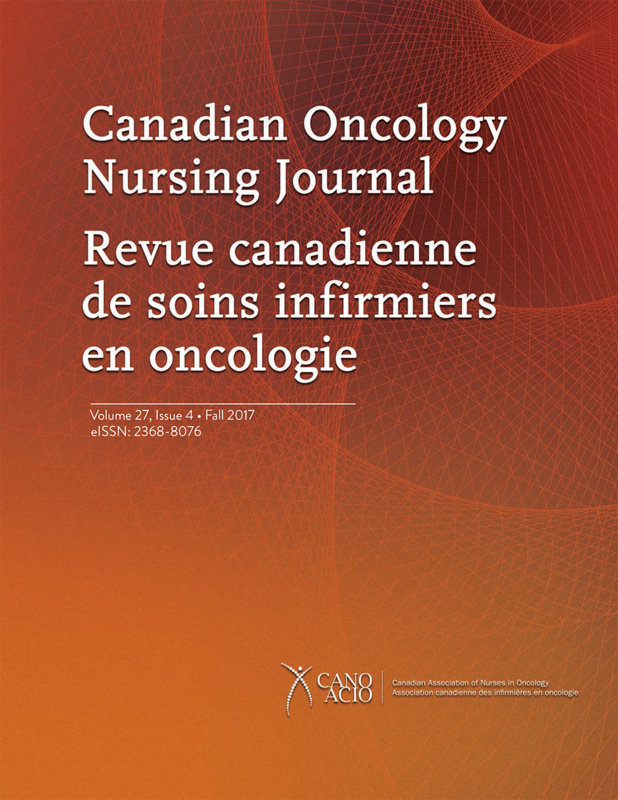 The Canadian Oncology Nursing Journal/Revue canadienne de soins infirmiers en oncologie is published for CANO by Pappin Communications, Pembroke, Ontario.